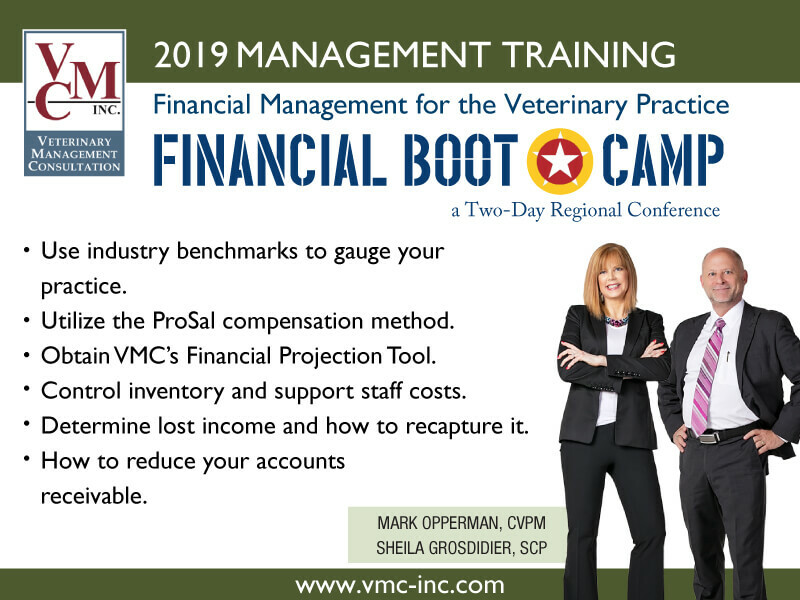 Financial Boot Camp - Veterinary Management Consultation | VMC, Inc. Understand financial trends, key economic indicators, and benchmarking. Learn how to capture lost fees. Control inventory and staffing costs. Find ways, such as payment options, to make your services affordable. Use internal controls and create a budget to make your practice thrive. VMC consultants understand the real-world situations faced by veterinary clinic owners, managers, doctors, and support staff. We present sessions that are fresh, engaging, and memorable. You'll come away with strategies you can implement immediately to increase your bottom line. Determine when it is (and isn't) cost-effective to invest in an expensive but dazzling piece of equipment. Avoid making the mistakes that commonly cost veterinary clinics literally thousands of dollars every year. Compensate your medical staff fairly. 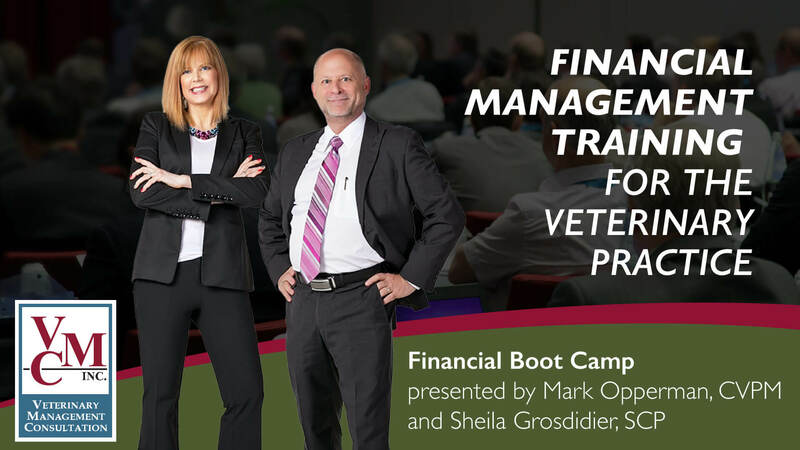 The VMC Financial Boot Camp has been reviewed and approved by the AAVSB/RACE program. Attendees earn 11 hours of continuing education (CE) credits. Internal Controls: Lost Income & How to Capture It: Financially, do you have a lot of "holes in your bucket"? The average practice loses $64,050 per year per full time DVM! This program was reviewed and approved by the AAVSB RACE program for 11 hours of continuing education. Please contact the AAVSB RACE program at race@aavsb.org should you have any comments/concerns regarding this program's validity or relevancy to the veterinary profession. "Up to date, relevant info. Mark and Sheila have a passion for what they do and a passion to help you succeed. Go!" "Worthwhile; go with your clinic numbers; this boot camp wakes you up and alerts you to what you can & should be reviewing on a daily, weekly, quarterly etc. basis!" "Absolutely essential to the success of a practice in today's economy." ‍Reserve room by 4/24/19 to obtain VMC Room Rate of $219.